In this paper tensile strength measuring apparatus developed by Tamrakar et al. (2005a,b) was used to measure the tensile strength of one dimensionally consolidated saturated NSF-clay and statically compacted unsaturated mixtures of NSF-clay, CFP-silt and Toyoura-sand. Tensile strength (qt) obtained from the tensile tests were compared with the unconfined compressive strength (qu). 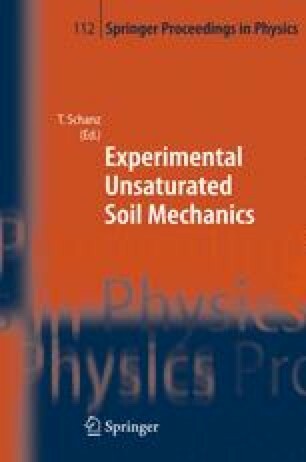 It was observed that the ratio qu/qt lied within the range of 2 to 3 for saturated NSF-clay and 4 to 16 for compacted mixtures. Effect of specimen thickness within the tensile mold, number of compaction layers and tensile pulling rates on the tensile strength were also examined. Comparing the specimen thickness within the tensile mold, it was found that the specimen having 5 cm thickness gave the minimum value. Also, tensile strength increased with the increase in the number of compaction layers. As in other shear strength, increment in the tensile strength was observed beyond tensile pulling rate of 0.34 mm/min. But below this pulling rate also, some increments were observed.